TAIPEI — This city is teeming with people. If you visit Ximending at night or Taipei Main Station by day, you’ll see thousands upon thousands of fast-moving, on-the-go Taiwanese. We’ve been here since Wednesday and took the direct EVA Air flight from Cebu. The airline is high-recommended. It’s clean, the leg-room on the Economy Class is spacious (like the Premium Economy seats at Cathay Pacific), and the 3-hour direct flight is speedy. After a quick lunch meal, a few Spotify playlists to listen to and a short nap, you’ve already landed at the Taiwan Taoyuan International Airport. We left at 11 a.m and landed at 2. At the airport, we were met by a local carrying a placard bearing my printed name. Assuming he was Taiwanese, I spoke in English. He answered in Bisaya! It turns out, he’s Wilbert Tan, a former Sacred Hearter who’s the batchmate of my neighbor on this page, Atty. Jingo Quijano, and of Bernard “Ironman-Bionic Man” Sia. What we like in Taiwan is the weather. With no offense meant for places like Singapore, Bangkok or Kuala Lumpur, what sets this nation of 23.5 million apart from the tropical countries is the cool, Hong Kong-like temperature. When we arrived last Wednesday, it was 19C. The next two days, it dropped to 14C. Perfect conditions for running. Of this sport that has invigorated millions, you won’t believe what we discovered. While our Pages family — 21 of us, led by our parents, Bunny and Allen, and my siblings Charlie, Randy, Cheryl and Michael, plus the children — strolled towards Taipei 101 (acclaimed the world’s tallest building in 2004), guess what sight had my heart pumping double its speed? 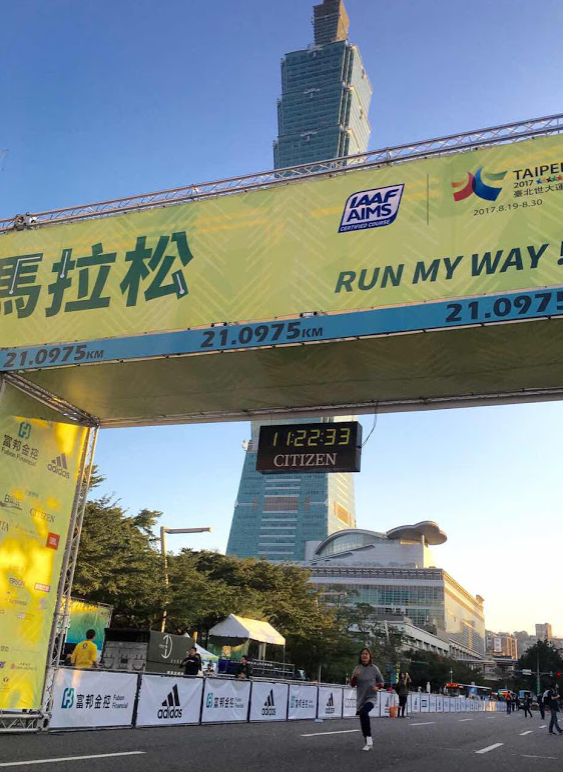 The Taipei International Marathon, happening today. Of all the times that our family visited, it was marathon weekend. With Jasmin and Jana, I quickly entered the Race Expo site hoping to join the half-marathon. “Sorry, registration has long closed,” the staff member said. Unlike Hong Kong (or our very own Cebu Marathon, which kicks off this January 8), Taipei doesn’t offer on-site registration. Too bad. This event is quite huge: they limit the entries to 7,000 runners for the 42K and 18,000 for the 21K. The cutoff time for the marathon is 5:30 and three hours for half that distance. 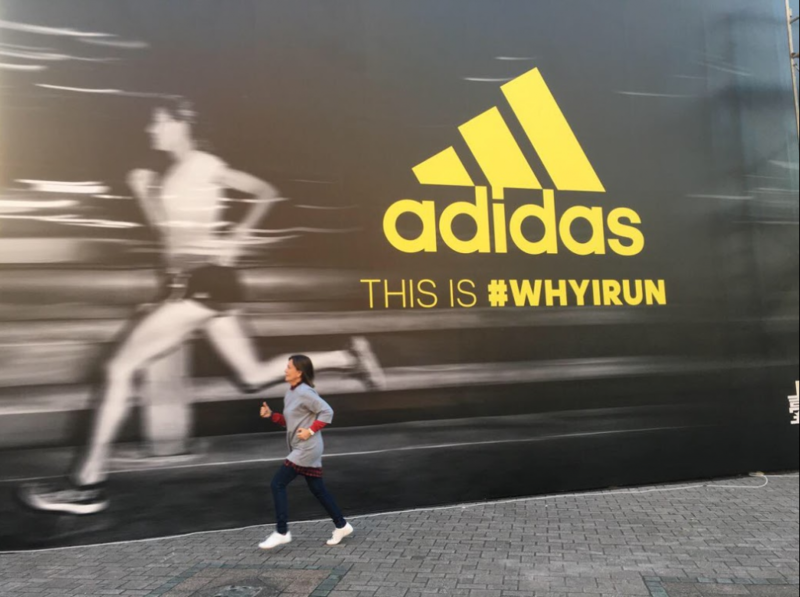 Running is popular in Taiwan. One example is the Nike Running store near Taipei 101 that spans three gigantic floors of nothing but running shoes, running clothing, running gear. Cycling? It’s absolutely big here. Taiwan is known as “The Bicycle Kingdom” and a huge number of bicycle components are stamped, “Made in Taiwan.” They’re led by Giant, the world’s largest bike company, which grosses over $2 billion and churns out an estimated 6.6 million bicycles per year (compared to the 3,800 they sold on their first year in 1972). Apart from bike manufacturing, bike-riding is also popular in Taiwan. Giant helped launch the YouBike sharing format. Aside from Taipei, it’s found in 10 other cities here, including Taichung — the city that Jasmin and I visited a few times before (and we love even more than Taipei). YouBike’s concept is simple: You visit one of many stations, you hop on a bike and drop it off in the nearest station of your destination. How I wish we can do this. Our problem is the lack of bike-lanes. Here in Taipei, like in many parts of the world where pedaling is encouraged (especially in Europe), there are dedicated bike lanes. In Cebu, how can we adopt this bike-sharing concept when we don’t even have proper pedestrian lanes?